14 November 2016 | Recently, a growing number of online travel agents and airlines have partnered with third-party data providers TripAdvisor and Routehappy to help customers learn more about the quality of their flight. 18 March 2016 | Expectations of airline passengers are not only shaped by how well an airline performs versus its direct competitors. They are also fuelled by standards set by experiences that consumers have in other industries, as innovative products and services in one industry raise the bar for all industries. This means airlines and airports need to tune into the customer from a holistic perspective when designing the passenger experience. At this year’s Passenger Experience Conference – which is part of the annual Aircraft Interiors Expo/WTCE in Hamburg – AirlineTrends delivered a presentation about ‘Digital Innovation and the End-to-End Passenger Experience’. Below is the outline of our talk, illustrated by a few examples of how airlines are tapping into the changing consumer behaviour and expectations of today’s connected travellers. As smartphones make it quick and hassle-free to order goods online, flag a taxi via Uber, or what have you, the on-demand economy has generated a sense of entitlement to fast, simple and efficient experiences as it taps into consumers’ appetite for greater convenience, speed, and simplicity. For example, analysis from Uber shows the longer Uber has been in a city, the less willing to wait for a car everyone becomes. 14 October 2014 | The travel industry is often at the forefront of trialling new technologies, and in the past year we have seen airlines experiment with the latest digital technologies such as Google Glass (Virgin Atlantic, Spring), smartwatches (Vueling, Iberia, airberlin), Virtual Reality (Thomas Cook, Emirates), and even drones (easyJet). Furthermore, the acceleration of wi-fi installations at airports and onboard aircraft will (finally) create ubiquitous connectivity. Combined with the large number of passengers carrying one or more digital devices (97 percent at last count), the rapid developments in digital technologies has created a perfect storm that sees many of today’s airline and airport passenger product and service innovations taking place in the digital realm. Reflecting the omnipresence of digital technologies in the passenger journey, a growing number of airlines are aligning themselves with the creative, entrepreneurial and technology industries by participating in events such as TED (Delta) and SXSW (American Airlines), immersing in digital culture by establishing a Digital Media Lab (Ryanair), or co-create new applications by organizing ‘hack-a-tons’ (e.g, American Airlines, Emirates, Vueling). In Europe, Lufthansa announced this summer it intends to invest a EUR 500 million in innovations groupwide in the run up to 2020. The plans should see a new ‘Innovation Hub’ established this year in Berlin – in order to be closer to the start-up and digital technology scene – and the set up of an ‘Innovation fund’ to expedite the development of promising new ideas from both within and outside the airline group. 27 May 2014 | The long-standing relationship between people and brands is broken. According to Havas Media, 54 percent of consumers worldwide do not trust brands. Much of the trust, respect and loyalty people had for many global brands have been falling for the last three decades. Due to irresponsible business practices and food scandals that have recently been in the news around the world, the dominant sentiment is that many organisations have become big by doing wrong. This confrontation of consumers with the consequences of mass consumption, results that consumers are slowly changing the way they live and consume. Consumption has moved beyond the merely transactional an instead of looking for “more”, consumers are on the look out for honest products and services in an authentic environment. They search for unique places and brands that they do want to be associated with and improve their wellbeing but most importantly, they can trust. Trust starts from scratch again by smaller companies and brands that are quite close to us. Brands which want to do right instead of doing less worse. And that’s why we see the rise of local flavor. Just have a look at the rising number of urban farmer markets or eco-friendly products in supermarkets. And why is it that we search for this radically good coffee made by a passionate barista in a place where we feel at home? 3 November 2012 | As many passengers today carry a smartphone, laptop and/or a tablet device, many airports around the world now offer services such as free wi-fi (often for a limited time), seating areas equipped with power outlets, while wireless charging facilities can be found on airports such as Toronto Pearson (Powermat) and Helsinki Vantaa (Powerkiss). Meanwhile, airlines like Delta (Recharging Stations) and brands such as Samsung (PowerPoles) have also installed public recharge stations in waiting areas. The latest amenity that caters to tech-toting travellers that want to stay productive while on the road are innovative seating concepts that allow these so-called ‘Digital Nomads’ to work comfortably. For example, besides providing unlimited free wi-fi usage, Vienna Airport’s new ‘Check-In 3’ terminal) features so-called ‘laptop chairs’ which passengers can use to work undisturbed. The semi-open cubicle seats, designed by the terminal architects Baumschlager & Eberle, are made from leather and besides a small table contain several power sockets. In Finland, airport operator Finavia has partnered with Finnish companies Martela (office furniture), UPM (plywood), Fortum (electricity) and Karelia-Upofloor (wooden floors) to introduce a new public lounge concept at Helsinki Airport. 3 October 2012 | The Internet has been the major force behind the emergence of the so-called ‘Amateur-Expert Traveller’: knowledgeable travellers, who – empowered by the likes of TripAdvisor, Zoover, SeatGuru, Bing Travel and TripWolf – often know more what to expect about their flight, accommodation and destination than most travel, airline or hotel agents. There is no shortage of online help for frequent flyers either. Websites such as Flyertalk, FrequentFlier.com, InsideFlyer and ExpertFlyer.com aim to help travellers make the most of frequent flyer programs, often by letting community members help each other. Online services such as EUclaim, ChangeYourFlight and Yapta, meanwhile, aim to help airline passengers obtain compensation for delays, cancellation, re-routing and denied boarding, avoid change fees, or get a refund if their ticket price drops. Considering the airlines’ sometimes non-cooperative attitude towards passengers who are claiming compensation or want to refund their ticket, online services such as Refund.me and EUclaim provide air passengers with advice and assistance on claiming their right according to EU Regulation 261/2004. For example, EUclaim has developed a database which tracks every commercial airliner in order to check whether the excuse passengers are given by the airlines for not being offered compensation is correct and legitimate. The company does not offer legal advice but rather a straightforward online solution for compensation recovery. After passengers have completed the official EU Complaint form, the EUclaim website takes them through the regulation via some easy to follow questions and then gives advice about the chances of filing a successful claim. EUclaim provides this advice free of charge, and based on the advice they are given, custumers decide if they wish to purchase one of EUclaim`s tailor made complaint packages. The company operates on a “no cure, no pay” basis, which essentially means that passengers who do not receive compensation do not have to pay any fees. However, passengers who do succeed in getting compensation get charged 27 percent of their compensation award. According to EUclaim’s website, so far the company has helped passengers submit nearly 55,000 claims to airlines. In another sign that in-flight entertainment (IFE) is increasingly mimicking the fast developments in digital consumer electronics (witness the flurry of recent announcements by airlines to make the Apple iPad available to passengers and crew). A similar burst of activity is currently taking place in wireless in-flight entertainment (IFE) as airlines are responding to the growing number of travellers bringing their own devices on board. Essentially an intranet on a plane that replaces the several kilometers of cables needed to connect every single seat, with a wireless network that allows passengers to connect to content on an onboard server with their own laptops, smart phones or tablet PCs, wireless IFE is a relatively cheap and light-weight solution for airlines. The system vastly expands the ‘standard’ IFE features with services such as online shopping and reservations, destination information, real-time travel information and seat-to-seat chat. Following early roll-outs by American Airlines, Delta and Brazilian LCC Gol, half a dozen of other airlines are currently testing (or have announced) a wireless IFE service. American Airlines (AA) in early August 2011 launched the “initial phase” of Gogo’s new ‘Vision’ inflight streaming video product, which AA calls ‘Entertainment On Demand’. Passengers flying on AA transcontinental fleet of 14 B767-200s on routes between Los Angeles, San Francisco and New York JFK, can wirelessly stream more than 100 movies and TV shows from an in-flight library to “select types” of wi-fi enabled laptops (video here). American is the first airline in the world to offer streaming video to passengers via their own wireless devices from an onboard server. How it works: Customers click on the Entertainment On Demand banner on AA’s in-flight wi-fi homepage, select a movie or TV show from the titles in the content library, create an account or log in, enter the form of payment (all major credit and debit cards are accepted) and click “rent.” Passengers can sort titles by movie or TV, genre, length of feature and other categories, and trailers are available for complimentary viewing prior to renting content. Movies and TV shows will remain accessible for viewing after the customer has landed – movies for 24 hours and TV shows for 72 hours. The service charges an “introductory price” of USD 0.99 per TV show and USD 3.99 per movie, and will not require customers to purchase inflight Wi-Fi to utilize the Entertainment On Demand feature. See this video for more. 11 June 2011 | We have reported earlier how Brazilian airline TAM is reaching the rapidly growing middle class in Brazil in innovative ways. The airline sells tickets via low-end retail chain Casas Bahia and at bus stations, lets customers pay in multiple installments, and provides ‘how to fly’ advice to first-time flyers. Meanwhile in East Africa, airlines such as Kenya Airways and Uganda Airlines have teamed up with mobile payment services M-PESA and Airtel Money to allow people without a bank account to purchase air tickets. M-PESA (M for money, pesa is Swahili for money) can be regarded as the African equivalent of the credit card and was first launched in 2007 by Kenyan mobile phone operator Safaricom, an affiliate of Vodafone. M-PESA allows Kenyans to transfer money via SMS instead of via a bank account, an important aspect in a country like Kenya where an estimated 30 percent of people (the so-called ‘unbanked’) have no access to formal or even informal financial services. With M-PESA, the user can buy electronic money at one of 24,000 M-PESA agents around the country and send this ‘e-cash’ to any other mobile phone user in Kenya, who can then redeem it for conventional cash at a snearby agent. M-PESA customers can do transactions of up to Ksh 140,000 (USD 1600, EUR 1100) per day and a maximum of KShs70,000 can be deposited, sent or withdrawn per transaction. A variable fee for transaction applies (example Ksh 150 for transactions between Ksh 20,000 and 35,000). Originally launched as a money transfer service for relatives abroad to send money home, M-PESA is also often used to pay directly for goods and services, from groceries at selected supermarket chains to electricity bills and taxi-cab fares. An M-PESA enabled mobile phone can also function as an electronic wallet that lets users pay directly for goods and services at one of 600 participating organizations. M-PESA does not pay interest on deposits nor make loans and users only need to sign up for the service with an ID card. 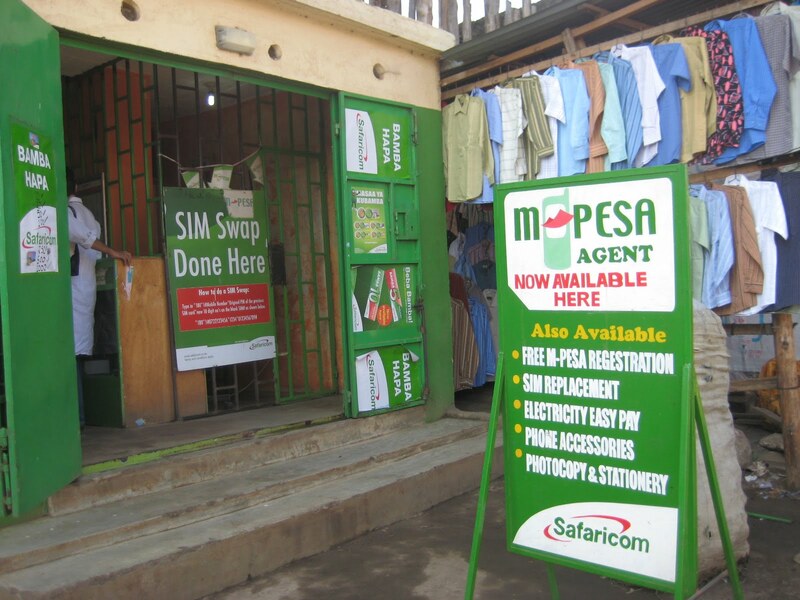 As of March 2011, the M-PESA service had nearly 14 million customers, or over 80 per cent of Safaricom’s customer base. M-Pesa has also been launched in South Africa and Tanzania by Vodacom, another Vodafone subsidiary. 29 April 2011 | In recent years, airlines have been experimenting with a wide range of non-traditional distribution channels, a development dubbed ‘Pricing Pandemonium’ by trendwatching.com. Examples include flash sales, happy hours, Facebook and Twitter-only fares, eBay and reverse auctions, as well as vouchers offered for sale in supermarkets and newspaper kiosks. Airlines are using these new platforms to temporarily offer heavy discounts without disturbing their main distribution channels. However, after initial experiments, some airlines also have made some of these new channels a more mainstream feature. For example, Tnooz reports that Air New Zealand has recently turned its popular reverse auction into an always-on service. ANZ’s ‘GrabASeat’ auction originally launched around three years ago and was only used ad-hoc to shift seats on specific occasions. However, as it did attract a reasonable following, the airline now offers a ticket deal through reverse auction every 15 minutes, 24 hours a day. The latest online phenomenon that has caught the eye of airlines is Groupon, a web site and e-mail service that offers extremely discounted deals only if enough people sign up. Subscribers must first pay for a Groupon (‘group coupon’) that unlocks the deal. Typical offers include discounted hotel stays, spa treatments and restaurants and Groupon makes money by keeping approximately half the money the customer pays for the coupon. Groupon rapidly became hugely popular and is credited for making virtual coupon-clipping exciting by having offers expire after just a few hours and cancelling them if they do not attract a minimum number of buyers. Launched in November 2008, Groupon already had over 50 million subscribers worldwide by the end of 2010 and in December 2010 turned down an USD 6 billion takeover bid by Google. Meanwhile, Groupon’s success has attracted numerous competitors, including Facebook, which has just started a similar service called ‘Deals on Facebook’. 18 April 2011 | Airlinetrends.com visited the recent Aircraft Interiors Expo in Hamburg and found that, besides the renewed interest in lighter and smarter interior solutions – as fuel prices are rising steeply once again –the most interesting developments today are taking place in in-flight entertainment and connectivity (IFEC). In recent years, several airlines have already rolled out in-flight Internet (mainly on domestic flights in the U.S and intercontinental flights of Emirates and Lufthansa) as well as USB integration between seatback systems and personal devices such as iPods and digital cameras. Low cost carriers, meanwhile, have started to rent out popular devices such as the iPad (eg. Iceland Express, Jetstar, airBaltic) and Sony PSPs (eg. easyJet, Jeju Air) to passengers. The airline industry has always captured people’s imagination, with the jet-setting lifestyle providing a popular ‘conversation starter’. Now, a new perfume concept and a company that sells customized t-shirts are capitalizing on the storytelling trend. The Scent of Departure is a new fragrance concept designed to capture the essence and spirit of cities. 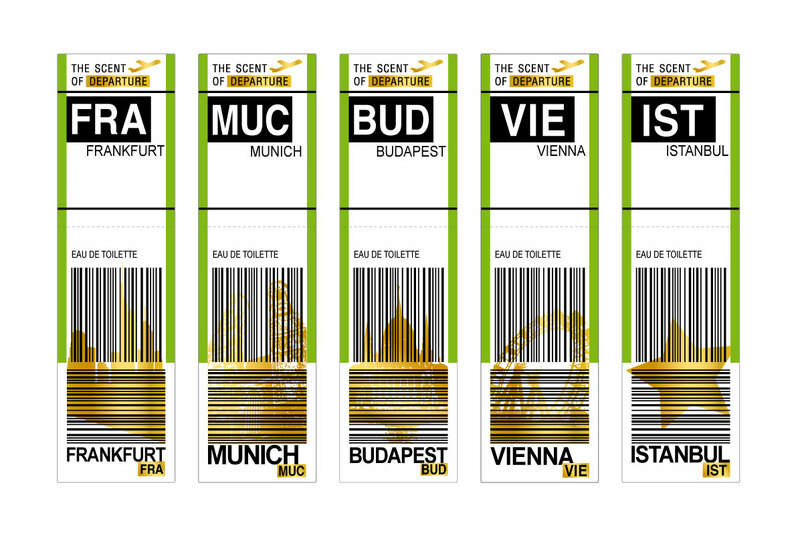 Each fragrance has been inspired by and created exclusively for a specific city, and comes in bottles labelled with a luggage tag with the three-letter symbol of the airports that serve them. To further add to the story, each fragrance will only be available at the duty free shops within the international airport it is named for. The collection starts with Munich / MUC, Vienna / VIE, Istanbul / IST, Budapest / BUD, and Frankfurt / FRA. In a nice twist, consumers can participate in the design and creation of future destination scents by filling out an online form asking them about the city they see for the collection, the perfume notes they think ought to be included and the image to put on the flacon.